21 Feb Why Google Shopping Campaigns Are Fantastic! Google Shopping Campaigns are fantastic! In the two years since we’ve started using them we’ve seen their performance continue to improve tenfold, to the point that they are now outperforming the more traditional search ads! One of the key components of their effectiveness is understanding how they work and how you can best utilise Google’s shopping platform to show your products at the right time; and for the right bid! Today I want to open the lid (slightly) on our Google Shopping strategy and give you some insight into how you can send your ecommerce revenue through the roof. Shopping ads consists of a title, price, store name and, most crucially, an image. They consequently differ to search ads as they do not require the creation of any ad copy. 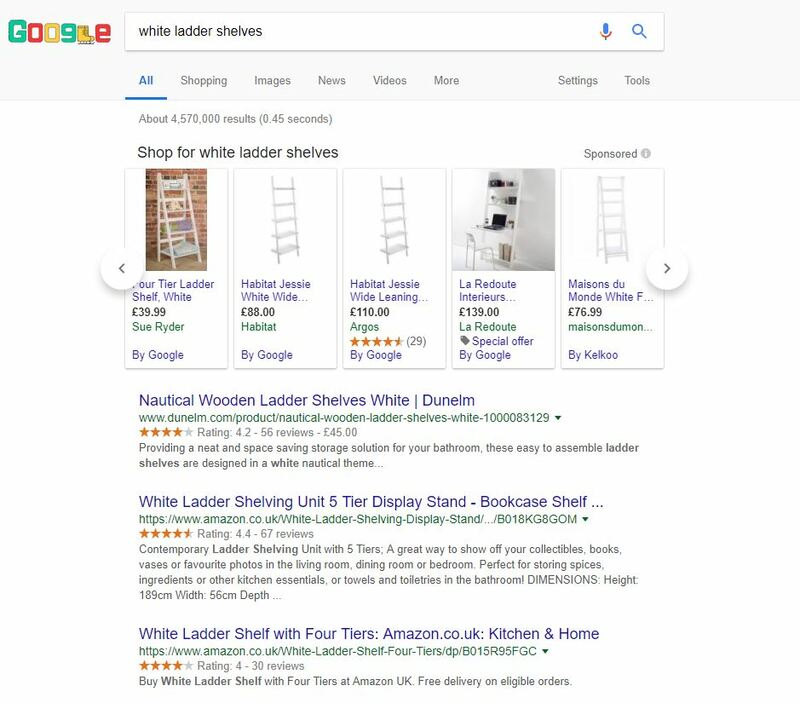 Google creates shopping ads automatically, using information provided by the advertisers in a Merchant Feed. It is therefore important to optimise the feed itself, as this effectively takes the place of the Ad Copy, by implementing a Shopping Strategy. You should be reviewing all product names and product type categories in your feed and optimising them with as descriptive keywords as possible. Conducting this process increases the chances of the Ad being shown, and therefore provides more opportunities to convert prospective purchasers. The other major difference with shopping ads is with how bidding works. In paid search, bids are placed at keyword level. In layman’s terms: The more profitable the keyword, the greater the bid. However, in Shopping Ads, bids are set by product. This is not ideal as different search queries have different intents of purchasing. For example, a user searching ‘buy pink umbrella’ has a higher intent to purchase than a search of ‘umbrella’. This causes a problem because we would happily pay more for ‘buy pink umbrella’, but we are unable to distinguish between the searches, as we are forced to bid at product level. The way around this problem is to utilise the priority setting for each Shopping campaign. Each campaign’s priority can be set to ‘High’, ‘Medium’ or ‘Low’. By creating duplicate campaigns with differing priority levels, we can control our bids by funnelling search terms into different campaigns based on intent. Using this system, a search of ‘umbrella’ would be sent to the ‘high’ priority campaign first, which would contain a low bid as it contains low intent search terms. You want to match to the ‘high priority’ first in order to show for as low a bid as possible to most keywords. Remember, Google chooses when your ads show – not you! So, by default we want it to be a low bid, until we know it’s a great search term. Once you have enough data, top performing searches would be set as negative keywords in the high priority campaigns, and these searches would be funnelled into a ‘lower priority’ campaign. These campaigns would then have a higher bid, as we are happier to pay more for a user who is more likely to convert. This system allows a much greater amount of control over our bids and has produced some fantastic results for our clients. This blog is a snapshot of my ‘Evening of Ecommerce’ talk I presented at upriseUP for one of our fantastic events. You can find more information about my talk here presentation library. Please do let me know your success with Shopping ads and I’d love to hear how you get on with implementing your ‘priority’ bidding strategy. If you would love for me to talk to you about how I think we can help your ecommerce even further, then please let me know below.